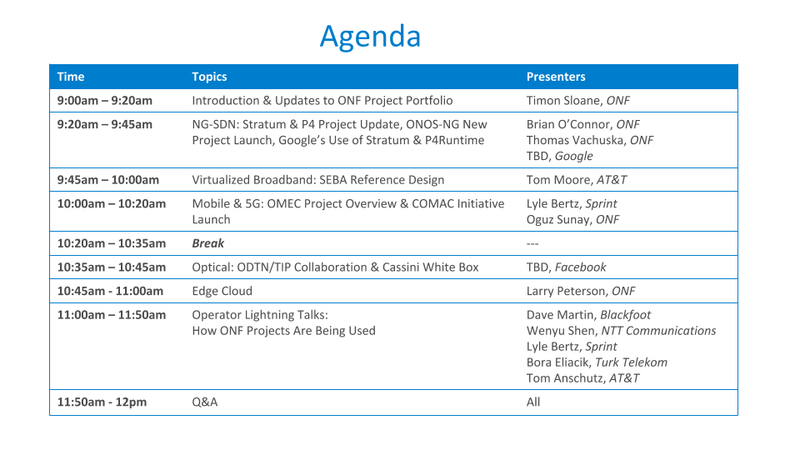 Register to attend the ONF Workshop on Converged Multi-Access Edge & Next-Gen SDN from 9am – noon on April 3rd. Featuring speakers from ONF, Google, AT&T, Sprint, TIP/Facebook, NTT and Turk Telekom, this workshop will enable attendees to gain an understanding of operators’ intentions and roadmap to next generation networks. Workshop topics will cover ONF’s unique operator-led portfolio of projects and their relation to the broader ecosystem of open source (from OCP, TIP and the Linux Foundation).